Dogwood Hollow—the new “Storybook Resort for Your Dog” dog-boarding facility—will celebrate its Grand Opening on Sunday, October 26 between 2 and 6 p.m. The facility is within easy driving distance of Nashville, Franklin, and Nolensville, at 9304 Independent Hill Rd, Arrington, TN 37014. The facility will have an enchanted forest/storybook theme. The Grand Opening—which is free and open to the public—will feature a family-friendly festival atmosphere. Attendees will enjoy light hor d’oeuvres, a fun photo booth, recorded Celtic Music, and the exclusive Dogwood Hollow Boutique. Also on hand will be several local animal-rescue groups, who will bring adoptable dogs looking for their forever families. All current customers who come to the Grand Opening will receive a free Dogwood Hollow tote bag, for when Fido comes to stay again. New customers who make a reservation that day also will receive a tote bag for their pooch. 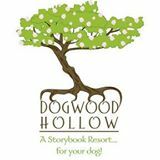 Dogwood Hollow is a cage-free dog-boarding facility designed like an enchanted forest/storybook world for dogs. Each dog or family of dogs receives his or its own private room. Every loving and caring touch is provided, in order to make a dog’s visit as stress-free and fun as possible. When each “furry baby” arrives, he or she is greeted with a “Faerie Kiss,” a touch of pure lavender essential oil rubbed onto the forehead. This immediately creates a sense of calm through aromatherapy. This is further enhanced by gentle, soothing music, which is piped throughout the facility 24/7. All of Dogwood Hollow’s rooms are completely indoors. Each dog is personally walked at least three times a day on leash, and also receives playtime in the outdoor play area. Each dog is interacted with and “loved on” frequently, in contrast to many kennels and boarding facilities with indoor/outdoor runs, where contact with humans can be sparse. NuVue Eyecare—the Lenox-Village-area optical and optometry practice—is excited to announce their upcoming “2014 Fall Trunk Show.” This family-friendly festival will be held on Saturday, October 18 from 10 a.m. to 4 p.m. at 6601 Sugar Valley Drive in the Sugar Valley Marketplace on Nolensville Road, just south of Lenox Village. The popular annual “Fall Trunk Show” showcases some of the deepest discounts of the year on beautiful, hand-made eyeglass frames such as Coco Song, Jisco, Etnia Barcelona, Valmassoi, iGreen, and iGreen Kids, along with wonderfully unique lines such as hand-crafted American-made frames by Frieze and Kala. “Fall Trunk Show” attendees will enjoy a complete fall-festival atmosphere at the event, including live music, food, wine, a Halloween costume contest for adults and kids, pumpkin painting, door prizes, and chances to win gift certificates to local businesses, as well as free eyewear. The event will be catered by Wholy Crepe Restaurant of Franklin, Tennessee. A portion of the festival proceeds will go to support Southside Animal Hospital. Nuvue Eyecare was founded by optometric physician Dr. David Gavami, and has been serving the south Nashville, Antioch, Brentwood, and Nolensville communities for more than seven years. NuVue has been featured in The Tennessean’s “Toast of Music City” for Best Eyewear and is pleased to provide personalized service and quality eyecare for each patient. Along with a beautiful optical boutique featuring more than 1,200 frames and an in-house optical laboratory offering the latest in lens technology, NuVue Eyecare offers cutting-edge eye imaging technology, as well as diagnostic tools for the treatment of eye disease that may result from conditions such as diabetes, hypertension, glaucoma, dry-eye syndrome, and cataracts. Dr. Gavami sees patients for both pediatric and adult eye examinations, starting with children as young as four years of age. Nuvue Eyecare is located at 6601 Sugar Valley Drive in the Sugar Valley Marketplace, just off Nolensville Road, south Nashville, 37211. For more information on the “2014 Fall Trunk Show” or to schedule an appointment to see Dr. Gavami, please visit www.NuVueEyecare.com. You are currently browsing the Underground Nashville blog archives for October, 2014.